“There are in the Royal City several handsome and well-appointed fancy-work and book stores, the chief being those of D. Lyall & Co., Z.S. Hall and Morey & Co.; whilst it is doubtful whether the Province can show a trader more enterprising and deserving in that particular line than Miss Peebles” (1). I have come across very few women in my research of early BC booksellers and stationers thus far, and none of them business owners, so this go-getter named Miss Peebles instantly grabbed my attention! Born in Scotland in 1856, Margaret Peebles arrived in New Westminster in 1888; her brother Peter was already established in the city in the furniture and real estate business (2). On September 1, 1888, Margaret opened a stationery and fancy goods store in the Queen’s Hotel building on Columbia Street. Her ads noted her thorough experience in this line of business, so presumably she had either worked in or run such a store in Scotland (3). 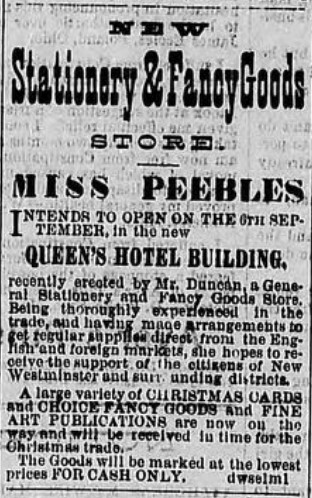 The ad for Margaret Peebles’ new stationery and fancy goods store (Daily British Columbian, September 1, 1888, p. 4). In any case, Peebles’ efforts in New Westminster soon drew positive attention: “So beautiful was the display in the shop window that our reporter was enticed inside and found one of the best regulated and most modern shops in the city,” gushed one newspaper review shortly after the store’s opening (4). 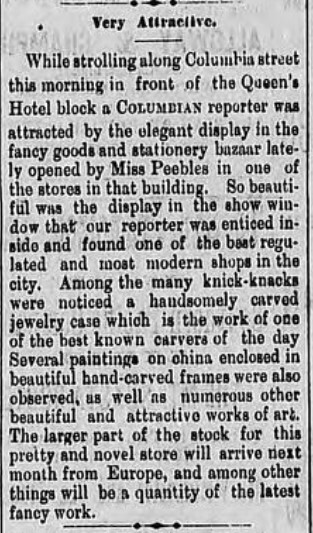 A glowing report of Miss Peebles’ store (Daily British Columbian, September 12, 1888, p. 4). In early December, Miss Peebles moved to a location opposite the Bank of Montreal. Although it sold general stationery and books, the business seemed to cater mostly to women with items like albums, photo stands, needle working supplies, and other “fancy articles and novelties for ladies’ work” (5). In September 1890, Miss Margaret Peebles became Mrs. Margaret McNaughton when she married Archibald McNaughton, a Hudson’s Bay Company manager in Quesnel who first gained prominence as a member of an overland expedition from Montreal to the Cariboo district in 1862. Despite her success as a businesswoman, marriage ended Margaret’s shop-owning days in New Westminster. Moving to Quesnel to be with her husband, she gave birth to a son, another Archibald, in October 1891. The baby died in June 1892, and Margaret never had any other children (6). Instead, she devoted her energies and literary talents to writing about her husband’s expedition. The resulting book, Overland to Cariboo, was published in 1896 by Toronto-based William Briggs. “Margaret McNaughton…has succeeded in placing before the public one of the most interesting and readable publications which has yet been issued from the press relative to that ever-to-be-remembered trip,” said one among several positive reviews (7). In 1900, Margaret’s life took another turn when Archibald died at the age of fifty-seven (8). In the years following her husband’s death, Margaret continued to write about BC’s history, publishing articles in the Daily Colonist and other publications (9). In 1905, she married again, this time to William Manson, a telegraphist a few years her junior (10). By 1910, she was the owner of the Cariboo Hotel and a 420-acre ranch across the river from the Quesnel town site. She also had a lease on an additional 640 acres, with the prospect of oil promising to make her a very rich woman. “While Mrs. Manson has travelled extensively at home and abroad, she always returns to the scene of her early marriage and will hazard her fortune in the development of this district in which she has so much faith,” reported the Cariboo Observer in 1910 (11). Faith (and fortune) or not, Margaret disposed of her Quesnel interests in about 1911 and took up residence in Vancouver, where she became popular “in the best social circles” (12). 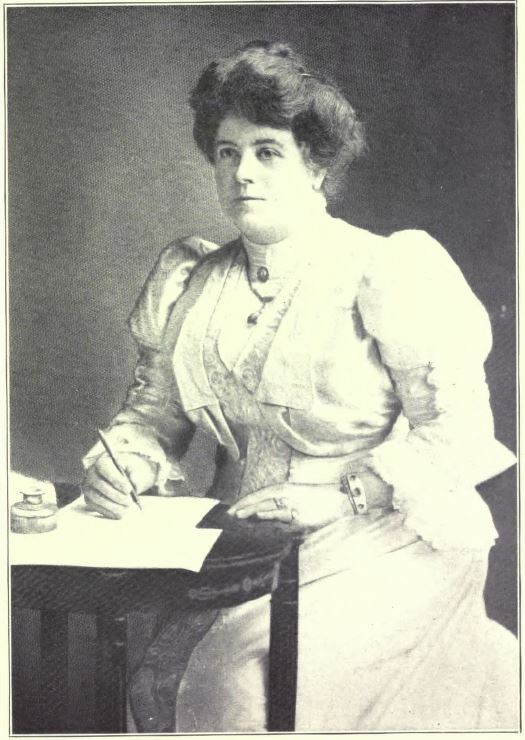 She was an active member of the Canadian Women’s Press Club, the Women’s Canadian Club, and the Vancouver Art and Historical Society, the last of which was all abuzz in 1914 when Margaret travelled to Hawaii and found a previously unknown letter written by Captain George Vancouver in the archives in Honolulu (13). Margaret McNaughton Manson, ca. 1914 (British Columbia from the Earliest Times to the Present, p. 332). Margaret was also a vice regent of the Pauline Johnson Chapter of the Daughters of the Empire and a lady associate of the Royal Colonial Institute of London; was involved in church and charitable work; and was presented with an honorarium from the government of BC for her work in preserving the province’s history (14). Margaret Peebles McNaughton Manson died on May 23, 1915, while in Los Angeles. “A woman of marked personality, genial disposition and public spirit, she will be much missed by many and over a wide area of this continent,” read one of the articles reporting on her death back in BC (15). Tellingly, Margaret’s second husband William is never mentioned in the obituaries that followed her death, nor in any of the reports about Margaret’s life after their marriage. He died in 1946 in Vanderhoof (16). (1) Vancouver Daily World (December 31, 1889): 7. (2) British Columbia from the Earliest Times to the Present: Biographical, vol. IV (Vancouver, Portland, San Francisco, Chicago: S. J. Clarke Publishing Company, 1914), 214, 217, 330-336. Peter and his wife, Augusta Grant, had six children, including Joan “Brownie” Peebles, who became a famed opera singer. (3) Daily British Columbian (September 1, 1888): 4. (4) Daily British Columbian (September 12, 1888): 4. (5) Daily British Columbian (May 27, 1889): 4. (6) Vancouver Daily World (June 16, 1892): 2; burial record for Archibald Henry Reid McNaughton, www.findagrave.com. (8) “Archibald McNaughton: One of the Best Known and Respected Old Timers Dead,” Daily Colonist (June 22, 1900): 2. (9) For example, “Wonderful Resources of the Cariboo,” Daily Colonist (January 31, 1904): 8. (11) “Oil Prospects at Quesnel’s Door,” Cariboo Observer (May 7, 1910): 1. (12) British Columbia from the Earliest Times to the Present, 335. (13) Vancouver Daily World (February 3, 1914): 11. (14) British Columbia from the Earliest Times to the Present, 335. (15) “Well-Known Vancouver Lady Passes Away,” Vancouver Daily World (May 26, 1915): 12. (16) “Retired Indian Constable Dies,” Prince George Citizen (March 7, 1946); burial record for William Francis Manson, www.findagrave.com. Previous Post Going Inside T.N. Hibben & Co. I love hearing about women like this because history books are filled with the exploits of men. Thanks for sharing!